When your veterinarian accidentally leads you down the wrong road! Serious trouble comes from socializing a puppy AFTER they have had their vaccinations. I can’t tell you how often I hear this dilemma from puppy owners. The vet said they can’t step foot outside of their house until the puppy is fully vaccinated (around 16 weeks old). The internet says the puppy needs to meet 100 diverse people in the first few weeks of having him, which is around the 8-12 week mark. Both of those scenarios do not give puppy owners and accurate view into what they can and can’t do, why, how and when! It can be maddening so I’m hoping to shed some light and perspective on the issue. Before we get into the “what should you do or can you do”, lets go over some facts. A puppy’s prime socialization time is between 3/4 weeks and 16 weeks old. A puppy doesn’t finish booster shots until 16 weeks old. Parvo virus is the dangerous virus your puppy could get (though unlikely) if you were to come into contact with any poop from an animal that has parvo. This is mostly dogs and occasionally other animals like coyotes. It is highly contagious. 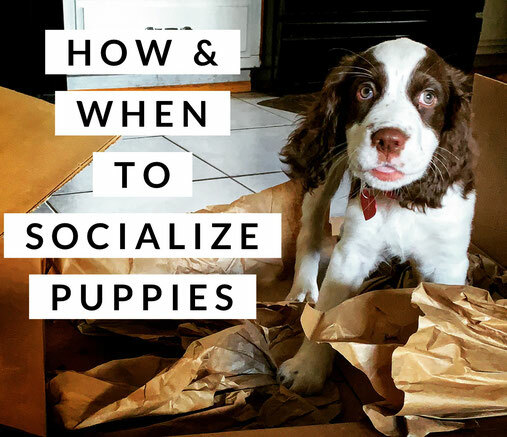 Because a puppy’s socialization time starts so early, it is up to the breeder to do much of the work, but you must understand, most of them do not. A puppy does not “grow out of things” that relate to bad behavior linked to emotional responses. For instance, a puppy that doesn’t want to check out other dogs and puppies. They have an emotional response by moving away, being tentative or stoic. This is not a “phase” they will get over. I know there are some exceptions, but that is the general reality of raising animals. If you don’t work them through things and help guide them regularly, they will not change and sometimes get worse. The idea of keeping your puppies inside and just having people over is a terrible idea that is a contributing factor to dogs over the age of 6 months old winding up in shelters and rescues. It’s very irresponsible to not fully unpack what puppy owners should do rather then just stay inside and scare them about parvo. If you are responsible and really look at your surroundings you can do some things outside and must do some things outside we are going to discuss. Then we will go over what to stay away from. I personally have learned that the missing link in the socialization talk with puppies is quality or quantity. So when you read online about puppy parties at your house, I encourage you to do that, but also look at the pup you have. That may be scary for them, or they may go crazy with too much attention! If you want to socialize your puppy, you need to find as diverse of situations, sights, sounds and surfaces that you can. After that first round of boosters, having someone come over to your house, men and women of different size, age and diversity is a great way to help your puppy. Make sure these guests will listen to you and not get crazy excited. When you first get your puppy you can teach them come and sit easily in 5 minutes if they are responding to food. Have the guests do the same thing. Then calm pets. Picking up the puppy calmly and touching feet, giving food, looking at ears, giving food, holding the puppy differently like on his/her back, etc. That is ideal! If people can’t come to your house you go to them and make sure they have an area you can put the puppy and not worry about ruining a carpet, because accidents are going to happen. Honestly, doing this once a week or at least a couple of times a month for a few months is very valuable. It’s a lot of work, I know, but it is so worth it. You do not have to have a party of 10 people. In fact, I am not a huge fan of that. Meeting people that I know will listen to me and not make the puppy frantic excited is much more valuable to me, even if that is only 4 people. I will just visit those 4 people as much as I can. Having huge parties or having people that go crazy when they see puppies will encourage your puppy to be frantic when they see people, so quality vs quantity. Socialization with other dogs should be done with another dog you know is fully vaccinated and has a responsible owner. Make sure you don’t let your puppy overwhelm the other dog or vice versa. Use food and encourage sniffing. Many adult dogs do NOT like puppies and will tolerate very little. This is NOT a chance to teach your puppy a lesson for being pushy. The only way that can even have a chance at working is if there are 99 positive interactions to every low key correction from the other dog. Often it is very necessary to settle down even a 12 week old puppy from overwhelming and biting another dog that isn’t interested. That is another blog for another time, but you must know you can’t allow that pushy behavior. For now I will mention using food with a tug on the leash to get your pups attention and work on basic obedience around other dogs rather then interaction if you are having that problem with your puppy until you can get a trainer to help you. Don’t rely on picking your puppy up all the time from bad situations like being pushy with a dog or getting into something in the house. Puppy Classes are a GREAT way to socialize your pup or checking online sources of other puppies in your area for playdates. Make sure the pups match relatively in size or a large breed puppy will make your puppy shy or feel the need to protect their space. It’s about creating positive interactions. Many puppy classes will allow you to come after 2 booster shots and just take off or cover your shoes in a sterile area. If your puppy is overwhelmed or scared, then it may be too much for them and during socialization, make sure the trainer matches your puppy with one other puppy that is a good match to build confidence if needed. I did this a lot when I taught puppy classes and I was shocked at how many clients had bad experiences at puppy classes with driven puppies overwhelming and scaring their pup and all they did was pick up their pup and then put them back down only to be scared again. Make sure you feel comfortable in your puppy class. That is just the tip of the iceberg! Don’t worry if you don’t have access to kids or very many people. There is more to be done! At home, play different movies (for sound and light changes…think superhero), radio and different sounds for your dog. You can use youtube or purchase a dog desensitizing sound cd. That way you cycle through traffic noise, fireworks, cat and dog noises, kid noises, etc. This can be played daily at a low level while you are away as well as working with your dog so the puppy gets used to it. Gradually up the sound level. Do this a few days a week. Vacuuming and daily chores are good as well. Find different surfaces for your puppy and puzzle toys for food. Get creative: Carpet is easy, hard floor, slick floor, a plastic lid of some sort that is relatively flat, bubble wrap, etc. If you do a youtube search for confidence building and socializing with puppies you will find all kinds of ideas you can implement at home. Make sure you are utilizing a front and back yard if you have one (assuming front yard is blocked off from other dogs) Doing this daily while working on come and basic obedience as well as play will go a long way in helping your dog build a relationship with you outside and inside. You can even start walks in the yard. I know not everyone can do this and if that is the case, you should work hard on place command and come inside for a week and I’ll explain why below! Get a travel bag and go outside! If your pup has had one round of boosters start taking your pup to run errands in a travel bag. Take your pup to work and have co workers say hello calmly (if it is okay with your boss). You can get a sling or carry your puppy to the park. Let your pup watch the world go by. It is JUST as important that not every person your puppy sees says hi as it is to have someone occasionally say hi. Use food to reward your puppy when people and dogs, bikes and skateboards, fire trucks and anything new go by. That is why it is a good idea to feed your puppy through training daily meals so you are not relying on treats. (expect your puppy to have an accident while traveling, it happens) There are many pet friendly places you can try as well. Still take your pup in a carrier of some sort, but it’s a great opportunity to observe. Even stopping by a vets office is a great idea as long as the dogs in that office are not barking. Again, keep your pup in the carrier or carry him/her without coddling/snuggling. If you have been working your puppy on leash in the house, courtyard, yard or even condo hallway, you can use those skills of come and place developed in a week outside! Take a mat, your pup, leash and food pouch and head down to the park. For extra caution bring a blanket. Find a quiet spot you are able to observe things going on around you and work your pup outside with everything going on. Stick to easy commands like come and sit and target them on the place mat/bed. Even setting up a little travel ex pen with a blanket on your day off is worth it if you live in an apartment building. If your pup gets anxious and starts jumping and barking at everyone, then you should look for one on one training right away to curb that early! A big one is CAR rides! Puppies often get car sick, just a heads up! But working on car rides that are short, gas station stops, post office stops where you can carry your pup in, etc. These are great ways to get your pup out there in the world. A big misconception is that your pup is outgoing and social now so you don’t bother to continue it. Puppies have a need to check things out at an early age. That is why, even though my list seems daunting, those are just ideas. They are not things that need to be done everyday! Quality vs quantity, remember?! But it is important to note that just because you have a friendly puppy, doesn’t mean you stop trying with a 3 month old. They change so much and it is really something that should be done thoughtfully, but regularly in combination with the training that will help a very driven and excitable dog to exist and not just interact. Don’t forget, what you do at home really speaks volumes for how your pup will be with people and dogs even if you don’t get to do a lot of socializing and I mentioned MANY examples of what to do at home. I must make note of my own personal preference when working with puppies with two booster shot rounds. If I have been working with a puppy on basic obedience and they are doing well, there is no reason in my mind I can’t go to a clean park in a very nice, well kept area and spend a little time on concrete in a small space working on come and place and meeting people I feel might be okay to say hi. (you don’t have to let anyone say hi, but you’ll have to get good at politely saying no) With that being said I understand the need to maybe take a blanket for the puppy to work on. (expect accidents) For me the benefits FAR outweigh the risks to have a well adjusted puppy vs the high amount of nervous, anxious and unhappy dogs I work with daily. With that being said there are some things I would not recommend. Stay away from dog parks with your puppy, they often carry disease like Giardia and that is HARD to get rid of, though not life threatening. It is also just a bad place to socialize a puppy. Stay away from public water areas or an area with any standing water. Many places have public areas for your pet to drink from a water bowl. That is a terrible idea for a puppy. Their immune system cannot handle all of the things on that bowl! Don’t let your puppy greet another dog or puppy that you do not know. Keep your puppy away from grass that isn’t in your yard. This blog was written for puppies 16 weeks old or younger.